Dri-Clean is a powdered detergent for use in cleaning all labware and equipment. Use Dri-Clean for soak, manual, and ultrasonic cleaning applications. Removes protein, dried blood, and most organic and inorganic contaminants from glassware, plasticware, ceramics, and metal surfaces. Completely free-rinsing and residue-free. 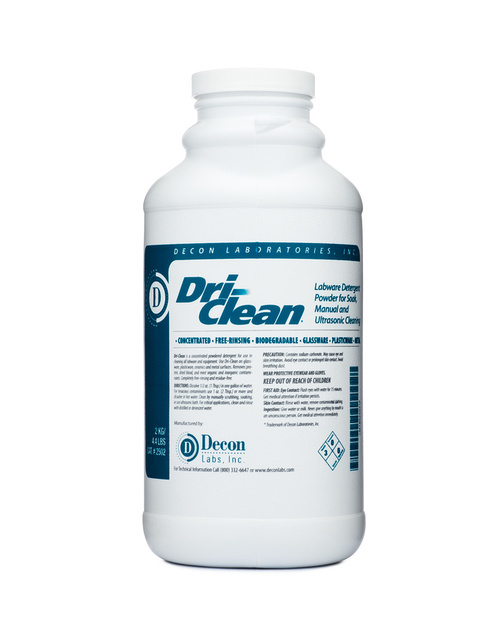 Dri-Clean is packaged in a wide-mouth plastic container with a convenient handle. This makes it easier to handle and prevents the absorption of water and caking associated with powdered detergents packaged in milk cartons.